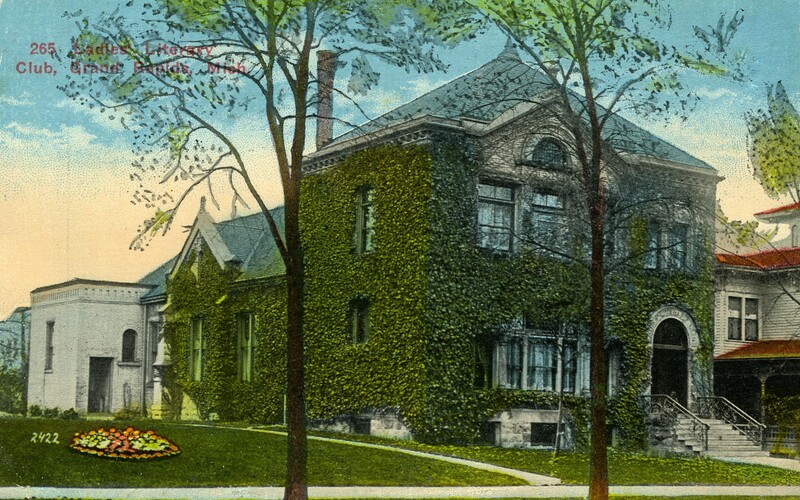 The hand-colored postcard depicts the brick, ivy-covered home of the Ladies Literary Club, an asymmetrically planned Richardsonian-Romanesque building with a square two-story facade with a rectangular single-story auditorium attached to the rear of the square. The auditorium is flanked on one side by a single story wing. Exterior walls are covered with common bond brick with stone faced trim. A slate hip roof covers the entire building. Title from postcard. It is one of the earliest Michigan structures built as a women's club.